1. Do make a plan- Like everything else, the first step for car relocation should be planning. Make a plan of what has to be shifted, how to go about it, what all to do in transit etc. This will come in handy when vehicle shifting is being done in Bangalore. 2. Do hire vehicle packers movers- Another important tip for vehicle relocation is hiring vehicle packers movers in Bangalore. They not only help you in moving your vehicle to your destination but also offer other services that make the shifting experience hassle free. From packing to documentation to moving your car/bike, professional movers in Bangalore solve all your relocation worries. 3. Do insist on insurance and paperwork- While you may have hired a good vehicle packer mover in Bangalore but you need to insist on proper paperwork to avoid any problem in the future. You also need to take insurance for your vehicle since your regular car insurance doesn't cover car shifting in Bangalore. 4. Do not fall for false charges- Always compare the costs of various movers in Bangalore and then make an informed choice. Do not fall for false charges for services you aren’t taking. 5. Do not forget to prepare your vehicle- Before handing over your vehicle for relocation, always check it properly. Prepare the vehicle for moving and then hand it over for car transportation bangalore. Check for any scratches, damage. Check oil, fuel other aspects before giving it for shifting. 6. Do not forget to choose carrier properly- Depending on the type of vehicle being moved, you should choose the mode of transportation. Do not give an expensive car for relocation in an open carrier. It should go in enclosed carrier. Similarly, choose properly which vehicle carrier your car/bike should be moved so there is no damage and you have peace of mind. 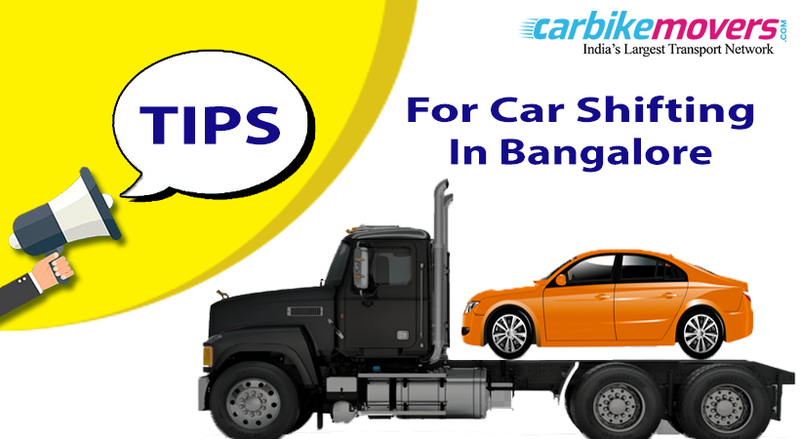 The above tips for vehicle relocation should prove handy when planning a car shifting in Bangalore.